Rambling up the southern side of the Heiligenberg, across the Neckar from the castle, one will find the Philosopher's Walk. Its name, it is said, stems from the fact that university professors and philosophers walked there, perhaps using the solitude of the forest and the incredible views of the city and surrounding area for inspiration. If you visit Heidelberg during the summer months, you will notice an interesting feature about the Philosopher's Walk – it has a climate which is much more temperate, almost Mediterranean-like, than that of the valley. In fact, you will see many plants growing here that normally cannot thrive in the northern, more milder weather, such as lemon trees, pomegranates, cypresses, and palm trees. One of the first places you can see this exotic vegetation is the Philosopher’s Garden. 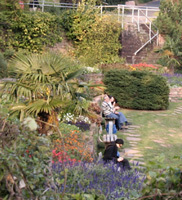 This has several flower beds and some benches as well, which allow visitors to sit, relax, and enjoy the view. Also in the garden is a memorial stone to Joseph von Eichendorff, a romantic poet who studied in Heidelberg from 1807-8. 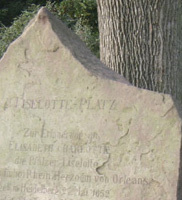 Farther along the lower branch of the path is the Lisolettestein, a memorial dedicated to Lisolette, the daughter of Prince Elector Karl Ludwig. She was married to the Duke of Orléans, the brother of Louis XIV. It was her inheritance to the Palatine region Louis tried to claim, unsuccessfully, which instigated the War of the Palatine Succession. To get a good idea of how the city of Heidelberg looked before any of the wars began, follow the path a little farther along to where Merianblick (Merian’s View) is. Merianblick is an illustration of a 1620’s copperplate engraving of Heidelberg, which shows the city and how it used to look before it was destroyed.